Where do you start with staff regarding digital transformation? The basic idea – show teachers what is possible. When you give them a model – this could be your classroom – are you willing to do this? Thomas Gentzel – Executive Director National School Board Association- need to be able to ask the right question. There are plenty of examples where initiatives haven’t worked. Second – a strategic view on where the system wants to go – before purchasing equipment. Michael Martiano – Superintendent St. Mary’s County- start with a cadre of our teachers – the level of excitement generated by early adopters spreads to other teachers. Build that cadre of support first. Chris Kennedy – as a district, set the high level – this is what we are about as a district. Rather than look to pilot schools, we replicate the conversation in each school then link the schools together. Allan Lee – superintendent Baldwin County – engage the community to see the benefits of technology – how students are learning, telling the stories of success. Michael Martiano – sometimes we don’t take advantage to tell the stories about technology – communities need to become aware of the advantages of the digital transformation. Thomas Gentzel – the traditional jobs are a way of the past and we need to tell the community we are preparing for the future. Chris Kennedy – As practices change, we see improvements using the old measures – this reassures the public. We are still doing some traditional assessment and the students are doing better. Allan Lee – Key point – ‘I no longer have to wait to learn’. Individual students learn in a distinctly different ways. Elementary teachers realize that the learning environment is dynamic – high school teachers need to see this. So what is the district going to do to assure success? The decision about the device comes lst – teachers will not change unless they have the good PD that they need. Demonstrating the power of blended learning. Technology cannot replace a good teacher, however it can assist with differentiation, it can assist students to be more engaged. Students take responsibility for their own learning. Blended Learning allows teachers to deliver curriculum in totally new ways. 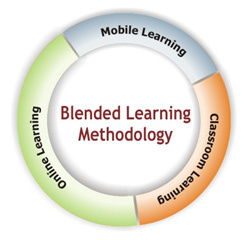 How do we encourage blended learning? Supporting our teachers means to support teachers as they try something new. They also have outside partners that help teachers to develop. Creation also of blended learning feeder patterns – centers where students can focus on learning blended learning techniques. Integrate the work into our everyday structures. Supporting schools that are integrating technology into key subject areas. Dr. Gene Carter Executive Director ASCD– Leadership is inclusive. It can be learned. We have the opportunity to encourage teacher engagement. We need them to sustain the energy for innovation. Higher ed personnel have resp to prepare grads to be effective teachers; schools must provide job-embedded learning. Teacher leadership is integral to change in schools. Marie Izquierdo Chief Academic Officer Miami-Dade – Digital leadership model – focus on visionary teachers, innovative, willing and open to have other teachers come into their classrooms. They are designated as model teachers that can contribute to the learning of their peers. Very rigorous mentor-mentee teachers – has ed to a great amount of success. Anthony Nash – Superintendent – a title does not make you a leader. It is critical that we create an atmosphere where teachers feel free to take risks. Teachers need to hear that change is going to be messy. Aileen Altman Mitchell Principal – Middle school principal – many partnerships with universities, Discovery Education and other organizations. Key formula for success – making sure teachers are empowered to be leaders. Teachers worked in teams – focused on professional development theme of their own choosing. Dr. John Malloy Director Hamilton Wentworth – We who lead believe that we are distributing leadership more than we are. Do we have the right conditions for shared leadership? Challenge – what don’t you know that people think you should? A block can happen if we cannot be honest learners together. How do we build a culture where teacher leadership can happen? you need to create systems where teachers can collaborate and try new things. technology at best is a tool that can facilitate good teaching. Learn together and no experts needed to bring in, because leaders emerge in all conversations within a school. time is precious – can we give teachers time to collaborate with their peers during the day? We don’t need to bring in people, just free up the schedule!